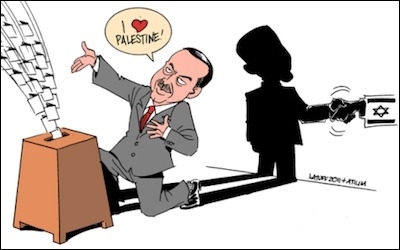 Turkish President Recep Tayyip Erdogan has reconciled with Israel after years of using pro-Palestinian rhetoric to appeal to his country's massive Islamist voting base. Ostensibly, almost everyone is happy. After six years and countless rounds of secret and public negotiations Turkey and Israel have finally reached a landmark deal to normalize their downgraded diplomatic relations and ended their cold war. The détente is a regional necessity based on convergent interests: Divergent interests can wait until the next crisis. UN chief Ban Ki-moon welcomed the deal, calling it a "hopeful signal for the stability of the region." Secretary of State John Kerry, too, welcomed the agreement. "We are obviously pleased in the administration. This is a step we wanted to see happen," he said. And Israeli Prime Minister Benjamin Netanyahu thinks that the agreement to normalize relations will have a positive impact on Israel's economy. "It has also immense implications for the Israeli economy, and I use that word advisedly," Netanyahu said, in likely reference to potential deals with Turkey for the exploration and transportation of natural gas off the Israeli coast. A few years ago, according to the official Turkish narrative, "Israel is a terrorist state and its acts are terrorist acts." Today, in the words of Turkey's Minister of the Economy, Nihat Zeybekci, "For us Israel is an important ally." Turkey has long claimed that it would not reconcile with Israel unless its three demands have been firmly met by the Jewish state: An official apology for the killings of nine Islamists aboard the Turkish flotilla led by the Mavi Marmara that tried to break the naval blockade of Gaza in 2010; compensation for the victims' families; and a complete removal of the blockade. In 2013, Netanyahu, under pressure from President Barack Obama, apologized for the operational mistakes during the raid on the Mavi Marmara. The two sides have also agreed on compensation worth $20 million. With the deal reached now and awaiting Israeli governmental and Turkish parliamentary approvals, the narrative on the third Turkish condition looks tricky. Announcing the deal, Turkish Prime Minister Binali Yildirim said that a first ship carrying over 10,000 tons of humanitarian aid from Turkey to Gaza, part of the deal between Turkey and Israel, will set out for Ashdod Port on July 1. A 200-bed Turkey-Palestine "friendship hospital" will also be put into service as soon as possible. Turkey's housing agency will engage in a development project in Gaza, too. And that is fine. But then Yildirim claimed that the embargo on Gaza will largely be lifted under the leadership of Turkey. That is completely wrong and simply an effort to cheat, aiming at Turkey's domestic consumption. A maverick way to tell Turkey's massive Islamist voting base: "Sorry, we have failed to remove the blockade of Gaza but are trying to sell it as if we did." Even before the deal, Turkey, like other countries, was free to send humanitarian aid to Gaza through Israel's designated port of Ashdod. Now it will send aid through the same port, not directly into the Gazan shores. Hence, Netanyahu's caution that "the Israeli naval blockade of Gaza would continue after the deal." By sending humanitarian aid through Ashdod, Turkey has effectively accepted the legitimacy of Israel's Gaza blockade. After six tiring years of concerted efforts to isolate Israel internationally unless Jerusalem removed the naval blockade of Gaza, Turkey had to go back to where it first took off and, in embarrassment, trying to sell the deal as a major diplomatic victory. One pro-government columnist flagrantly wrote: "Ankara opened a humanitarian corridor to Gaza and accomplished the freedom flotilla's historic mission." All the same, the government's propaganda machine now spreading the message that the great power Turkey got Israel on its knees is not always working well. "It looks like the government has given up on its principles and values. It will lose support as a result," said Ismail Bilgen, whose father was one of those killed on the Mavi Marmara. "The Justice and Development Party [AKP] enjoys great support due to its resolute principled stance on issues but this move is in total contradiction to that." Restoring ties in this manner is unacceptable. The Israelis are acting like the compensation is an act of benevolence on their part rather than a punishment for their crimes ... My father and his friends died trying to bring international attention to the inhumane blockade imposed on Gaza and to have it lifted. It now appears like their martyrdom will have been in vain. Our struggle will continue no matter what. I am against it [the normalization deal] completely ... In no way should an agreement be reached or friendship established with the Zionists calling themselves Israel, and who have blood on their hands ... Our president [Recep Tayyip Erdogan] when he met with us told us the blood of the Mavi Marmara martyrs was sacred. I hope our president doesn't concede to Israel in any way and doesn't make a deal. Too late, too wrong. The deal will go through, and under the approving looks of Erdogan. Ironically, the futile Turkish effort to end the naval blockade of Gaza is ending in quite a different direction: Now that Turkey has agreed to send humanitarian aid through the Ashdod port, it accepts the legitimacy of the blockade.